When a person is vaccinated, they receive a small amount of a pathogen (the thing that causes the illness) via an injection which causes the body to suffer a mild form of the disease (or a different strain of the disease) against which immunisation is required. In this way the body's defence system builds up antibodies or immunity against further and possible more lethal attack from the disease in the future. Who Discovered & Developed Vaccinations? Although the Chinese had knowledge of immunisation as early as the 10th century, the first documented medical trial was conducted by Edward Jenner in the 18th century. He saw that milkmaids who had contracted cowpox seemed to be immune to a more deadly strain of the disease, smallpox. He put this theory to the test by inoculating a small boy, James Phipps, from Sarah Nelmes, a young girl who had cowpox. He later injected the boy with smallpox. Because of his exposure to the milder disease, the subject did not develop smallpox. Louis Pasteur developed the techniques and created vaccines for anthrax and rabies in the 19th century. The most prolific number of vaccines were developed by Maurice Hilleman (measles, mumps, hepatitis A and B, chickenpox, meningitis, pneumonia and the flu). The World Health Organisation (WHO) is looking to eradicate various deadly diseases and has been successful. The last naturally occurring case of smallpox was in 1977, polio has almost been eradicated with measles the next on their list. So Where is the Controversy? The medical journal The Lancet published an article that claimed autism could be triggered by the MMR (measles, mumps & rubella) vaccination. This caused such a scandal, despite the fact that the claims were founded on very sketchy evidence, that many anti-vaxxers still believe that vaccinations may do more harm than good. There is also the belief that, because a disease had been eradicated, there is no longer any need to receive the vaccination against it. This is unfounded as diseases living in unvaccinated hosts are able to mutate into stronger strains and thus infect even those who have been vaccinated thus destroying what is known as herd immunity. There have been recent outbreaks of whooping cough, scarlet fever and measles probably caused by abstinence from vaccination. Click here for printable copy with discussion questions and exercises. Explain, in your own, words how vaccinations work. Who was Edward Jenner and what did he do? Which scientist from the 19th century is mentioned and for ehat reasons? Can you name three diseases which are mention in the text? What does WHO wish to achieve? What are the fears of the anti-vaxxers? Which belief is unfounded according to the text? Do you know what you have to vaccinated for? What vaccinations are required by law in your country? 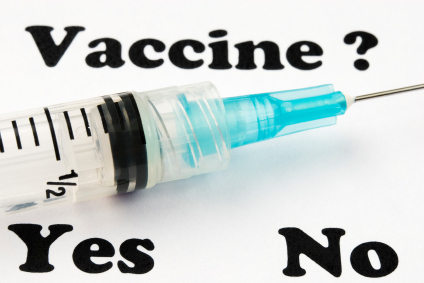 Is vaccination a prerequisite for attending school or children's social activities? Are there punishments for not vaccinating your child? In your opinion, do parents have a moral obligation to immunise their children? Can you think of any grounds where not immunising a child is justified? Which diseases would you like to see vaccinations developed for? Authors note: I have tried to be impartial and represent both side equally, as well as give further reading to support both sides. As a mother of two vaccinated children who have unvaccinated friends, it is a subject on ongoing interest for me and your comments will be of great interest.